Say what you will, but nothing compares to a traditional pen. Its weight, its looks and the feeling of pressing it against the paper are simply unparalleled. If you too simply can’t give up this unique feeling no matter the technological advancements, this post’s for you! Kicking off the list (and hopefully what will be a light, enojyable workday) with this adorable paper pen. Eco-friendly and irresistibly colorful, it is hand rolled out of used magazines. Perfect for those who appreciate a light touch when it comes to jotting down ideas. Its fun print and no commitment approach will prove to be useful even around the house when writing to-do or shopping lists. Sounds just about right, doesn’t it? What a stunner! According to its maker, this pen blank was hand-turned on a lathe, then sanded 24 times with progressively finer grits of sandpaper to create a smooth surface and lacquered, for an enviable shine. In the end it was assembled with high quality rhodium and golden titanium components into something that is much more a regular pen! Whether you get one for yourself or thinking about getting it for your significant one, this much’s for sure: it’ll make any occasion to write even more special. 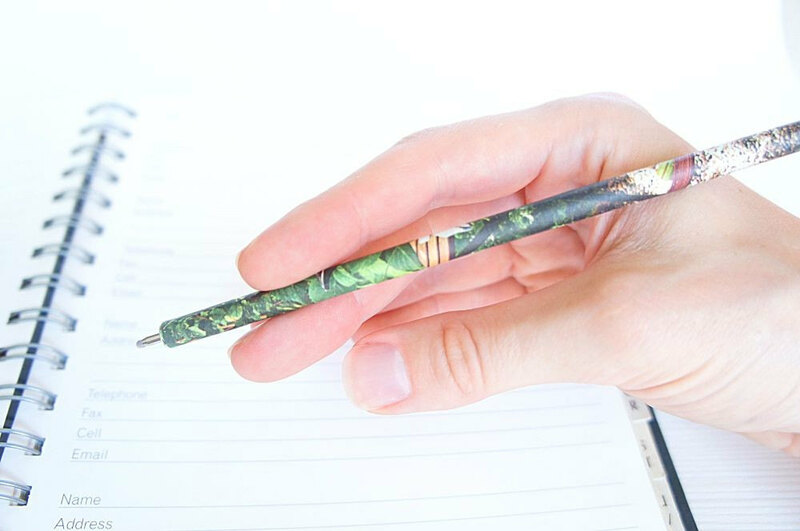 Is a wooden pen not exactly the best fit for you? Well guess what: we’ve found just the thing to get your creative writing in motion again. This red handmade pen will satisfy your taste for impeccably crafted things. Featuring a daring red swirl body which is highlighted and complimented by chrome and smoky accents, this pen will appeal to the boldest of creators. Stop everything: this hand-turned segmented wood fountain pen is so cool that it’ll make you want to switch back to paper even if you’re a digital convert. Why, you ask? This made-to-order beauty is made from big leaf maple burl and red bloodwood (which explains the incredible color scheme) and is flawlessly finished with chrome hardware to effortlessly complete its unique look. Elegance is the first word that it brings to mind, making it an ideal gift for your mother, sister, aunt or even… for your lovely self. This eye-catching and timelessly stylish pen will make sure its owner will stand out and look amazing in a sea of blandness. So chic! And, finally! You may not kickstart your every workday by taking notes with a quill pen, but rest assured you’ll long for it as soons as an extravagant occasion comes along! A standout companion for a wedding guestbook, a functional photoshoot prop or even a unique décor item for your home… who would have thought quill pens could be so versatile even in this day and age? Fact is, you won’t lack the opportunity to show it off! Oh, and in case you were wondering, you can also pick the preferred length for the feather (25 cm or 30 cm) so that it’s just right for what you had in mind. And, thankfully, you can also choose between ballpoint or nib pen. Absolutely flawless!